For the past couple of months, I've been profiling one of the series that appear on my personal Top Ten list. I don’t claim that these are the ten greatest series of all time; that would be presumptuous. However, I do presume to identify those shows that mean the most to me. And now, we've finally come to the end: #1. These aren't academic histories or encyclopedic entries; rather, they’re personal memories of shows that, through the years, have brought me delight, influenced my way of thinking and doing, left their indelible traces imprinted on me. Think of it as a memoir of my life as seen on TV. To be honest, I’m not quite sure how I wound up watching Top Gear, let alone how it became my favorite show on television, the number one show on the Top Ten list. My relationship with cars has always been a complicated one. On the one hand, the first sports magazine I ever subscribed to was Stock Car Racing, which my aunt bought for me for my sixth birthday. * My favorite sports stars were drivers like Mario Andretti, A.J. Foyt and Fred Lorenzen, my ancient toybox was filled with smacked-up racing cars of one kind or another, and like many little boys of the era, I had a giant 1:32 scale Eldon slot car racing set in the basement. *By contrast, I had no time for Hod Rod Magazine. On the other hand, I had no real interest in cars themselves. Perhaps it was growing up in a family of women, but I never had the urge to get my hands greasy, to take engines apart and put them together, or to build a go-kart. * I didn’t even want to learn how to drive – something about it being too grown-up, perhaps, which might well be the same reason I never started drinking coffee. I was in school, so I didn’t want to grow up. (And this was before I’d even heard of Toys-R-Us.) I never had the urge to “run out of gas” as an excuse for a make-out session – there were other ways, after all. *I take that back – somewhere in the inner recesses of my mind I’ve just remembered some kind of a kit that I got for Christmas one year, that was all about making your own go-kart. But it was only the tools and the instructions – no pieces, of course. You had to furnish that yourself, which is probably why I lost interest in it quickly and forgot about it for the next 45 years. I progressed this way for the next few decades. At the same time I grumbled about having to go through driver ed and behind-the-wheel classes in high school (after I passed my test and got my license, it would be another ten years before I’d actually drive a car), I also tried to figure out how I could get out of going to a classmate’s birthday party in order to watch the Indianapolis 500. When a new job forced me to buy a car, I drove without enthusiasm, and whenever I found myself in a subsequent job search, I always looked first for one that would enable me to take the bus. Even in the last few years, when I’ve been driving more than ever before, I still look at it as more of a chore than anything else. Even though it was the car that enabled me to drive to the store where I bought my new die-cast Shelby Daytona Cobra coupe. Against this backdrop, a television show about cars wouldn’t seem to be the most promising choice for prime-time viewing. But then, Top Gear isn’t just about cars. In fact, some would say that it’s hardly about cars at all. I stumbled on to it one Monday evening while channel surfing. At the time, the only program I watched with any regularity on BBC America was Doctor Who, so the network wasn’t exactly a destination stop. And to this day I have no idea why I lingered over Top Gear that night. I have no idea what was on, what misadventure they were engaged in. Perhaps it was the idea of a studio audience on a car show that intrigued me. Maybe it was the Star in a Reasonably Priced Car. Or possibly it was that things always seemed to be catching fire and blowing up. It was probably a little bit of all that, combined with there being nothing else to watch. * I watched the last minutes of that show and then, upon finding out they were programming back-to-back episodes, I stuck around for the next one as well. *An appalling number of my favorite shows have started out that way, as alternatives to not having the TV on at all. I haven’t missed an episode since. It’s very hard to describe Top Gear to someone who’s never seen it. It’s true that it’s an automotive show, in which three blokes sit around talking about cars they’ve test driven, demonstrating their turning radius, their naught-to-60 acceleration, how it handles the curves and whether or not the ride was smooth. In other words, not the kinds of things in which I have a particular interest. There’s a lot more to it than that, though. The show’s hosts – Jeremy Clarkson, Richard Hammond and James May – while making serious points, don’t take themselves all that seriously. They’re knowledgeable, but also funny, opinionated, and (especially Clarkson, the first among equals) decidedly politically incorrect. In fact, as I think of it, that might have been the show’s appeal to me at the outset, the idea that they weren’t afraid to say what they thought regardless of whom it might offend, without being rude, crude or boorish. Well, at least not too much – these are guys, after all. There were the “challenges,” such as a race to see who could cross Japan first – Hammond and May on the country’s famed bullet trains, or Clarkson in a supercar. The challenges, which came to dominate many episodes, did offer somewhat serious reviews of the cars, but never in so much detail that it would interfere with the essential absurdity of the moment – that is, unless you didn’t think it was absurd to watch a nun crushing cars while behind the wheel of a monster truck, or a race between different kinds of buses, or an experiment to see whether a harvester could be converted into a snow plow, or an attempt to build a reusable space shuttle using a car instead of a space vehicle. And then there were the celebrities, the “Star in a Reasonably Priced Car,” who would first be interviewed by Clarkson, after which we’d see the star taking a lap around the circuit, often with hilarious results. Some of the celes, the British stars mostly, were new to me, but there were other Petrolheads (Gearheads to you and me), Tom Cruise and Simon Cowell and Jay Leno, who were not only excellent drivers, but were knowledgeable, funny guests as well. And I mentioned The Stig earlier – he’s the show’s silent partner, the “tame racing driver,” always mute, wearing a white suit and white crash helmet, seemingly capable of nothing besides driving cars at high speeds around the show’s test track. (He also preps the celebrities for their race laps.) He’s invariably introduced by Clarkson using some bizarre description – “Some say that his voice can only be heard by cats, and that he has a life-size tattoo of his face on his face.”* We can’t know who or what The Stig is; whenever his identity is outed, he’s killed off the show and replaced by a new Stig (we’re on the third right now). *Clearly, to my mind, the inspiration for Dos Equis’ Most Interesting Man in the World. If you’ve never seen Top Gear, I don’t know that this description would have made much sense, or would do much to encourage you to watch it. But really, this is a show that defies explanation. It’s a car program and a comedy hour, a celebrity chat show and a reality competition. It’s been on the BBC, in one iteration or another, since 1977, with the same three madmen hosting it for the last ten years (Clarkson, has been on, with a break, since 1988) and it’s as popular today as it’s ever been. 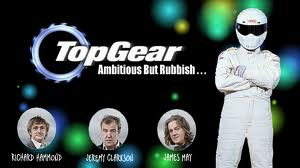 And then there’s something else about Top Gear, perhaps the best explanation as to why the show appeals to me so much. Yes, I’ve gotten a finer appreciation of cars; I’ve even warmed to the idea that driving can be fun, although the best way to do it is on a track with a fast sports car. But beyond all that, Top Gear is about a state of mind, the romance of the road, the days when being behind the wheel of a car gave one freedom to go anywhere, to experience anything. It’s a show that fights the self-defeating prophesy of the environmentalists who worry about pollution, who worry about oil reserves, who worry about living itself. It’s a celebration of human ingenuity, of technical marvels, and of the desire to go faster as a way of measuring progress. And, as each season comes to an end, there’s invariably a moment when a more serious tone is struck, with the realization that this is a world, a culture, a way of thinking that’s slowly going away, never to return; that we have the ability to build a car – itself a noble thing, to build something using your hands and your mind and the machines you’ve designed – you can build that car that can go so fast, that can do so many things – but there’s no longer a need for it. I may never own one of the cars they’ve profiled – I may never, in fact, get beyond tolerating my commute to work each day – but thanks to Top Gear my relationship with the auto has changed forever. It is, quite simply, the best show on television, and it gives me absolute pleasure and enjoyment to watch it.